LAKEVILLE, IN. 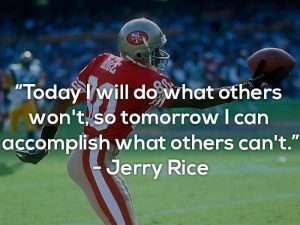 – Champions are made in the offseason! This summer, LaVille head football coach Will Hostrawser, is asking the Lancer Football team to continue that championship mentality. The 2017 LaVille football team won its first sectional championship since 2003, and the Lancers want to continue moving forward. This summer, however, there are some slight adjustments in the weight room workouts. “Summer workouts are going really well,” said Hostrawser. “The players are really pushing their limits and getting out of their comfort zone consistently. They have really bought in to what we are asking them to do. All the players are rallying together each day – it’s real fun to be a part of the development. Hostrawser has created time slots from 8 – 9 a.m., 9 – 10 a.m., 10 – 11 a.m., 4:30 – 5:30 p.m., and 5:30 – 6:30 p.m.
It’s a whole new strategy and style change. “I decided to make this drastic change for two reasons,” explained Hostrawser. “First, while a one rep max provides a measurement of pure strength, it really does nothing to enhance the athleticism of our athletes – in fact I believe it hinders athleticism. In all sports, rarely if ever are athletes put into the situation where a one rep max lift comes into play. Thinking of the bench press – how many times in any sport is this direct skill used? Games are fast paced and there is a lot of movement involved. These revised workouts are geared toward just that – enhancing athletic movement as well as strength – specifically core strength. Following the graduation of the football class of 2017, the fall of 2017 was thought to be a “rebuilding” year. The Lancers started 1-2, and then were 3-4 before rattling off five straight victories and the first football sectional title since 2003. “Our atmosphere has always been “raise the bar,” said the sixth year coach. “Each group is challenged with leaving their mark on our program a little higher than the last – with each season that becomes a little more challenging. 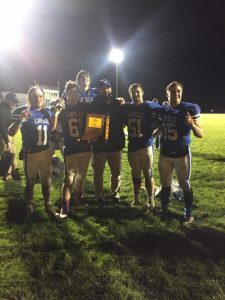 “Last season’s sectional title was a special time for us – no one expected us to achieve it because we were “rebuilding” – winning it made it all the more special,” continued Hostrawser. “But that was last year – It’s in the past. We are lucky enough to have earned the right to reflect on it for enjoyment from time to time, but there is work to be done. And the Lancers want more! Seven (7) weeks from today is the first official high school football practice in Indiana – Monday July 30!